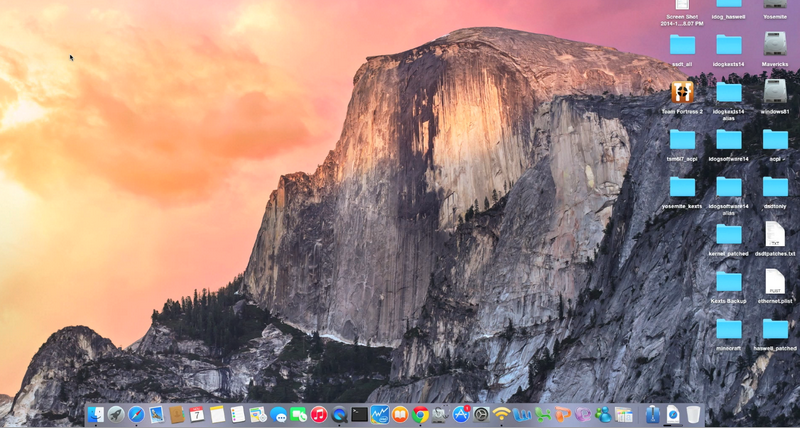 Alright, after we installed Mac OS X Yosemite, there are things we need to do to get the laptop working its best. Most of the time, we have to boot with safe mode and in safe mode, ntfs or fat partitions will not be seen by Mac, so the best is to prepared all the necessary kexts and apps and put them in the USB Mac OS X installer. I don’t use distros or packed apps like multibeast or the new Mackintosh VN tool to install kexts because I want to know what I install in my system. Again, if they work for you, then GREAT. The best is to understand what you’re doing instead of blindly using these seem to be simple tools. Kext tools are: Kext Helper B7 (install only on booted partition), Kext Wizard (can install kexts to different partitions), Kext Utility (create caches and repair permission only on current booted partition). Downloaded the latest boot loaders : Clover and Chameleon and put them on the OS X installation USB drive also. For UEFI install Clover, for partition use Chameleon. I installed both just in case one fails, the other will boot.